This weekend most of us are enjoying our time off of work with our families and loved ones. Some of us are enjoying a long weekend on holiday while others may be enjoying a BBQ in the park. However, let’s not forget the significance of this weekend, especially Monday, May 25th. This special day, known as Memorial Day, is a time for all of us to reflect back remembering and honoring those brave men and women who selfishly lost their lives while serving in our country’s Armed Forces. These brave men and women paid the ultimate sacrifice while allowing us to enjoy our freedom. To the families of our “Fallen Heroes”, we will never forget the sacrifices made and forever hold you in our thoughts and prayers. During my career in the military I had the pleasure to serve with a fallen hero who I will never forget. I first met John at a previous unit where we served together as the crew on a Coast Guard C-130 airplane. John was a flight engineer who was extremely knowledgeable on the aircraft systems as well as one of the top mechanics that I’ve known. He was looked upon and highly regarded for his expertise. I was a navigator on the C-130 and John and I spent many hours doing various missions and deployments together. I can honestly say I might not be here today if it weren’t for the quick actions of John to save us from a junior pilot’s mistake during a routine training mission. I will never forget just how kind he was and he had a laugh that I will always remember. I eventually transferred to a new unit, USCG Air Station Sacramento, California located on McClellan AFB, where I spent a few more years before leaving the military in 2001 for a new opportunity. Sometime after John was transferred to Sacramento where he held the rank of Chief Petty Officer. 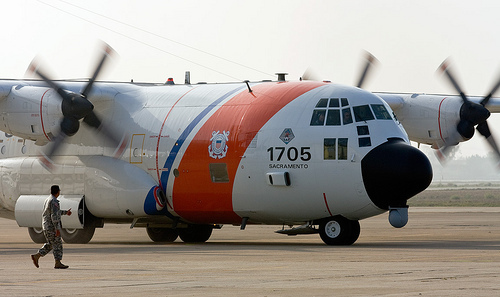 On the eve of October 29th, 2009, USCG aircraft 1705 departed on a Search and Rescue (SAR) mission to search for a missing person off the coast of San Diego, CA. John was the flight engineer on this mission along with six other crewmembers. Around 7pm, about 50 miles off the coast at an altitude of about 1000 feet, the C-130 was involved in a midair collision with a Marine AH-1W Super Cobra helicopter with a crew of two. The helicopter was actively engaged in a training exercise near San Clemente Island. According to the Aviation Safety Network, no single factor or individual act or omission caused this mishap. I recall the moment I heard the news of the midair collision and was shocked as I had been there in that same situation many times before and logged many hours in that same aircraft. However, once I found out that I knew one of the crewmembers I was floored. John was a fellow aircrew member, a military brother, but most importantly he was my friend. He will be missed, he is missed, and his life was lost while protecting others. Rest in peace my friend, Chief Petty Officer John Seidman. You are forever in our thoughts. So please take time this weekend to reflect back on those who lost their lives while protecting ours. There is a great program called “Folds of Honor” that provides scholarships and educational opportunities to the children and spouses of those killed or disabled while in service to our nation. If you know of someone who may benefit from this program please share this with them.